There will be an in-person training at the Center of Excellence in Generative Medicine (University of Bridgeport, Connecticut) for the weekend of May 19-20. This weekend training hosted by the Center of Excellence in Generative Medicine at the University of Bridgeport, Bridgeport CT, USA. A rare opportunity to receive hands-on training in Opus23 from Peter D’Adamo and key developers of the platform. The seminar is a mix of some lecture and extensive hands-on learning. During experiential sessions, attendees will break up into 4-5 person workgroups. Each workgroup will have its own teaching assistant (TA), a GM/COE clinician with extensive experience with Opus. Attendees will work directly in Opus on a series of different clients. Successful completion of the onsite training allows you full access to the Opus23 software, with the ability to upload and analyze raw data from 23andMe, Ancestry, Genos and uBiome, and produce notes and patient reports. The seminar will run from 9AM-5PM Saturday, May 19 and 9AM-12PM Sunday, May 20. Classes will take place on the University of Bridgeport campus, at the Center of Excellence in Generative Medicine, 115 Broad Street Bridgeport CT 06604. Lunch will be provided on Saturday at the COEGM as well as dinner at a local restaurant. Cost of the seminar is $800. Registration is available at the below secure PayPal checkout and will be limited to 15 individuals. Please email Dr. Robert Boyd at dr.boyd@datapunk.net if you are interested. Don’t Fall into the Methyl Trap! Methyl trapping is a situation in which folate becomes trapped and unusable by the body. 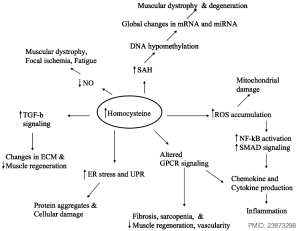 It is defined as a functional folate deficiency that alters homocysteine metabolism such that folate–dependent resynthesis of methionine is compromised. The term methyl trapping is now applied to the cascade of symptoms of neuroexcitation following supplementation with folate, or B12 or SAMe as a first line treatment for MTHFR SNPs. The unassuming consumer who takes supplements with methylating B vitamins may experience varying degrees of neurotoxic symptoms manifested as apparently unprovoked insomnia, rage, anxiety, brain fog and alcohol intolerance (induced sulfite and aldehyde toxicity), often after experiencing a brief period of improvement from low energy and cognitive impairment. Low energy and irritability occur because of a dysregulation within the methionine cycle due to one-carbon metabolism SNPs causing an accumulation of methyl compounds often complicating histamine degradation. 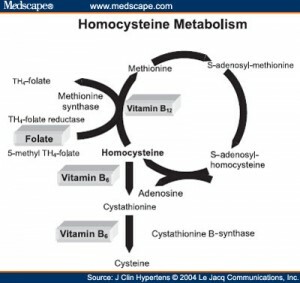 A build up of homocysteine is the consequence, often worsened by a bottleneck at CBS (cystathionine beta synthase) due to down-regulating SNPs in the homocysteine clearing transsulfation pathway. Neuroexcitatory and depression symptoms ensue from the complication of BH2-BH4 pathway reversal, resulting in incomplete ammonia-clearing by the urea cycle and reduced neurotransmitter formation. SNPs in MAO and COMT reduce degradation and transporter protein SNPs contribute to dopamine-serotonin imbalance. (2) Patients can also experience poor wound healing, aggravated digestive symptoms of bloating, alternating constipation and diarrhoea, or worsened IBS as a result of reduced methylation capacity. Clinicians should screen for conditions that may overwhelm transsulfation and detoxification pathways including infection, autoimmunity, toxic body burden, problems with blood sugar and fat metabolism and other inflammatory indications. Non-methylating nutritional support should be provided for mutations in MTR/MTRR, BHMT, SHMT2, MAT1A, CBS, QDPR, OTC, CPS, ARG2, PCBD1, MAOA or B, COMT, HNMT, DHPR, NOS1, 2, 3, SOD1, SOD2, PEMT, PON1, ABCB1, cytochrome P 450 genes and Soluble Carrier Family transporter protein SNPs, ACAT1-02, in deciding when to support Methylation cycle SNPs. Practitioners can use cutting-edge cloud-based software curated by naturopathic physicians. Mobocaster is a cutting edge application in Opus23 Pro offering the practitioner scenario-specific genetic analysis including power factors and relevant descriptions. metabolism in children with Down syndrome: in vitro modulation. Am J Hum Genet. Finkelstein JD. 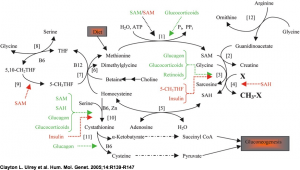 Pathways and regulation of homocysteine metabolism in mammals. Semin Thromb Hemost. 2000;26(3):219-25. Review. PMID: 11011839.